Famed for his lyrical, subversive voice, Catullus was Rome’s first and foremost poet. Amid the death of the Roman Republic, his life, as told through his poetry, was beset with love, loss, political conflict and above all, a desire for escape. Catullus’ Bedspread follows the young poet’s journey from his native Verona to Rome, filled with all the indulgences and sexual, social mores of the time, and then his lasting affair with the married Clodia, whom he would immortalise in his poetry. While Catullus and Clodia made love in the shadows, the whole of Italy was quaking as Caesar, Pompey and Crassus forged a doomed allegiance. When the older Clodia in turn betrayed Catullus for another man, the result was his greatest work, Poem 64: the wonderful, mythical tale of a sorrowful marriage and a lover’s desertion, told through a picture on a bedspread. For a year Catullus turned his back on Rome, Italy and love. In his journey of escapism he encountered new geography, new cultures and at last an understanding that there was no escape, that yearning for the past, recent or ancient, is futile. Following a brush with the might of Caesar, and a cunning evasion, Catullus died, at the age of just thirty. 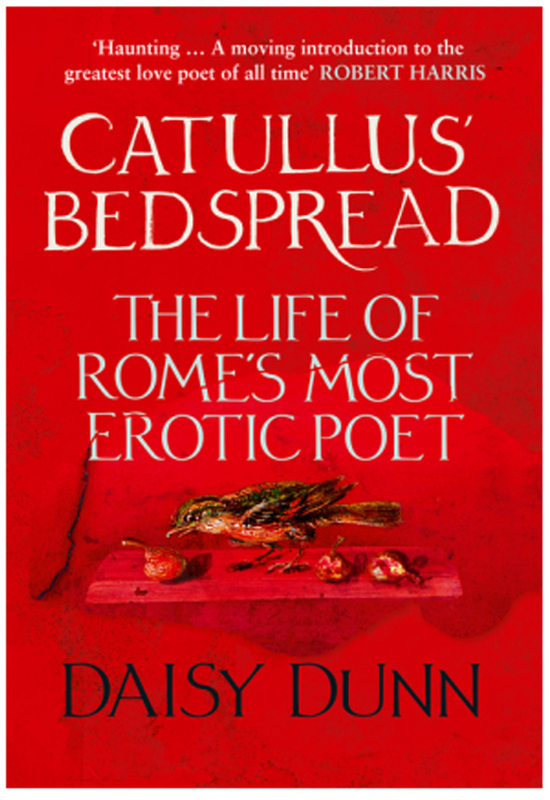 Drawing on his peerless poetry and turbulent circumstances, Daisy Dunn’s immediate narrative rediscovers Catullus the man, Rome’s most ‘modern’ poet – oscillating between the glorious past and the vivid, sensual present.